Main Characters: Vincent (of van Gogh fame! ), Camille, Camille’s Mother and Father. Yellow’s such a beautiful colour. Yellow’s the colour of the sun, of cornfields and of fresh butter.And yellow’s the colour of sunflowers too and buttercups and leaves in the autumn. Vincent, in turn, asks Camille what color he would paint the house if given the choice. Camille thinks deeply and replies with the answer-green. Green reminds Camille of the grass, leaves and spring… and frogs. Then he changes his mind and replies with the answer-blue. Blue reminds Camille of the sky, the colour of his own eyes, the colour of his father’s big coat and his own cap. Then Camille changes his mind yet again and replies saying he would paint the house red. Red is the color of strawberries and roses. As Camille changes his mind a picture of the house in three different colors can be seen. Mister Vincent laughs aloud when he hears about Camille’s problem with picking a colour. He remarks that Camille loves colour as much as he does. At this point Camille’s mother and father arrive at Mister Vincent’s house. Mister Vincent comments that Camille has been a great help to him. Camille protests and says that he hasn’t helped Mister Vincent yet, he’s only been talking and drinking lemonade. The job that Mister Vincent had in mind for Camille is revealed, however, when Mister Vincent shows the whole family the canvas he has been painting. It is a portrait of Camille. Camille stares in wonder at his own image and feels like he is looking into a mirror, only with many different colours. The reds, greens, blues and yellows that they had talked about are all captured in the painting. Favorite Part of the Story: In accordance with the theme of painting the book is a very visual one. The images of the train scooting across the train tracks and Camille looking into the pond and catching his own reflection are very striking. The images of Vincent’s yellow house are beautiful and it is nice to see it metamorphose into a green house, blue house and red house in quick succession. What is most delightful are the illustrations of Vincent, Camille and Camille’s father which are instantly recognizable from van Gogh’s paintings. Also not to be missed is the sneak peek into Vincent’s yellow house drawing room, which is filled with canvases of van Gogh’s most memorable creations. Portrait of Camille Roulin, 1888, Van Gogh Museum, Amsterdam. This is simply a lovely book to get your child excited about painting and coloring. A lovely introduction to van Gogh. The story is insightful and the illustrations stellar. Don’t miss the opportunity of opening up this delightful book. 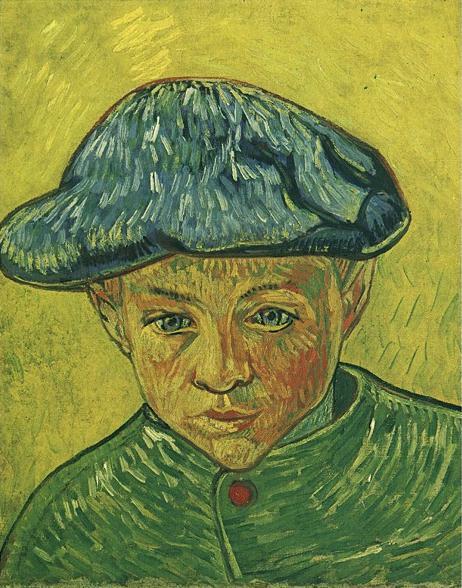 Incidentally, the Camille from the book ‘Vincent and Camille’ is Camille Roulin, a small boy of the Roulin family, van Gogh was friendly with during his time in Arles. 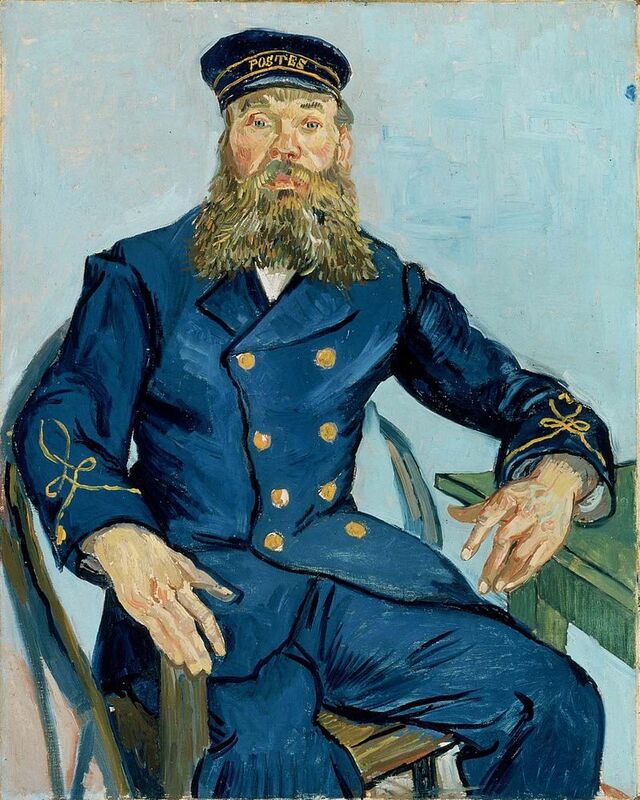 Camille’s father is Joseph Roulin, postmaster, depicted in several of van Gogh’s memorable paintings, one of which is displayed at the Museum of Fine Arts in Boston. Van Gogh painted multiple portraits of each of the members of the Roulin family. The portrait of Camille, aged 11, described in this book hangs in the Van Gogh Museum in Amsterdam and is entitled ‘Portrait of Camille Roulin’, 1888. Many thanks to BudgetTraveller and frommadeiratomars for picking up this book for Little M from the Van Gogh Museum, Amsterdam. 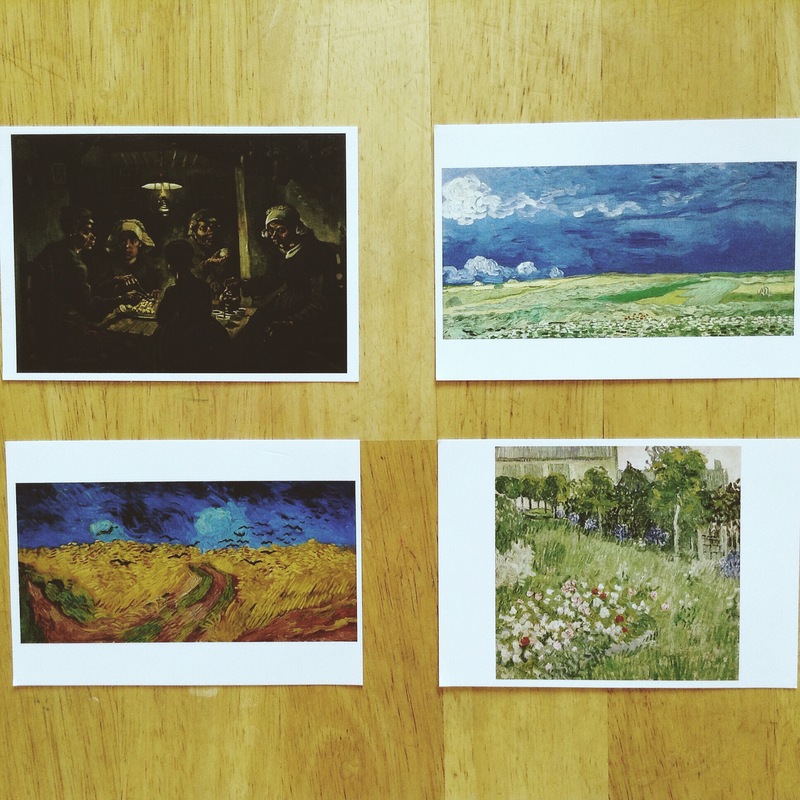 Leaving you with some beautiful postcard images of van Gogh’s works.